if applied correctly, a bit of Slow will ensure that your thesis has more flavour than most. I first mentioned Zotero a while ago but didn’t go into very much detail in that post. Since then, I’ve been experimenting with it a bit and am really starting to enjoy it. It’s a Firefox extension that facilitates the research process by streamlining the collection of information accessed through the browser. With more and more academic content becoming available online through open access journals, it’s an innovative method of aggregating and managing content for research. Zotero has a decent set of content management features that really do a good job of making it easy to work with the information you save. I won’t go into the specifics here because the quick start guide makes it really clear. As well as the content management features, it’s also very good at recognising semantic content on the web and giving you options to import that content into it’s database. For example, if you’re browsing PubMed, Zotero is able to import citation information and then to export it in many different formatting styles, including APA. I actually don’t use Zotero for any academic content at the moment. What I find it really useful for is annotating and working through ideas I come across in blogs. I find that I can clarify my own thoughts around educational technology, using Zotero as a scrapbook to develop those ideas. Which brings me to my only problem with Zotero. I only use it for blogs right now because it’s only really useful for content you access through the browser, which is a major limitation for me. While it’s true that most of my literature is accessed through the browser initially, I still keep local copies that I prefer to work with. Although I think the application is great in it’s current form, I’m really hoping that the developers expand it’s scope. Maybe make it a standalone tool that I can use to manage all my articles, no matter if they’re on- or offline and no matter what format they’re in. I also need more space within the app because sometimes it can feel crowded (especially the right hand panel), and making it standalone will free up a lot of real estate by taking it out of the browser. 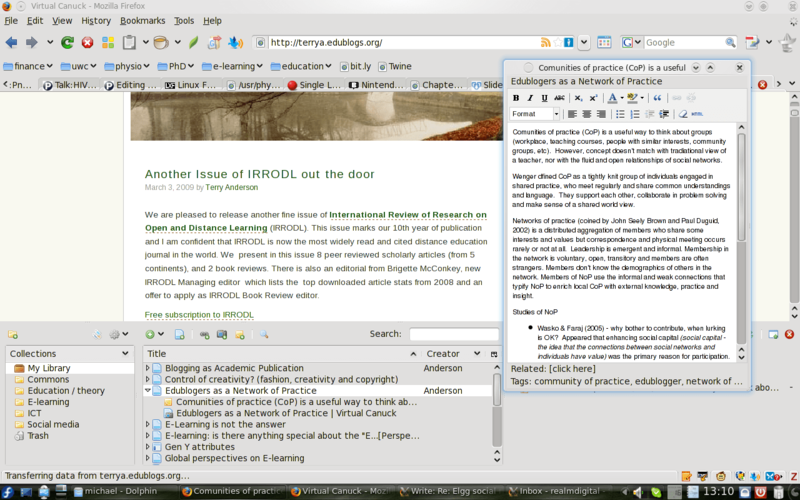 Note: you can run Zotero in a full tab, but I like to be able to read the blog while making notes. Those things aside, this is a great browser extension that I’d definitely recommend checking out.